Instructor Bio: Kym lives on the Gold Coast, Queensland Australia and is an international speaker, teacher, author, co - inventor of sewing related products and together with Ann Duncan, they own The Sewing Revolution Pty Ltd. Kym has presented and taught extensively in Australia, New Zealand, Thailand and the United States of America especially in the past 3 years where she has presented events for 6 months of each year. They have been invited to present and teach for most of the major Sewing Machines manufacturers. They combine patchwork, quilting, appliqu? and machine embroidery together with amazing results. The work done by them speaks for itself and is of an exceptional and original quality. Kym and Ann have appeared in many magazines both as contributors and had profiles done on them and their work. They are constantly devising new methods and rulers for all aspects of sewing and will continue to do so. They have now invented several different rulers to save time and effort with patchwork and quilting as well as machine embroidery and appliqu? placement. Kym and Ann are ruler designers for Creative Grid USA and proud to be part of that family. Their first book, an Instruction Book on the use of The Sewing Revolution is about to go into a seventh reprint. Infinity Quilt has been very successful being sold worldwide and was reprinted in 2013. 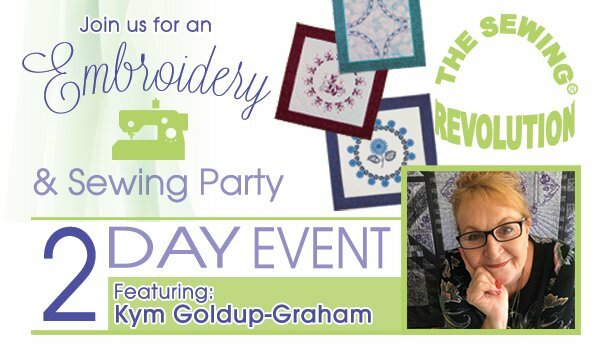 They are both passionate and enthusiastic about their craft and love to share the secrets to sewing learned along the way. You are guaranteed to not only learn from this presentation, but also be entertained and leave with a smile on your face. Knowledge is nothing unless it is shared with others. Their mission is to inspire and motivate sewers, quilters and patch workers in creating beyond anything they dreamed possible.